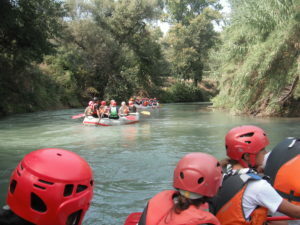 The rafting descent takes place entirely in the Roman countryside just outside the city. The Aniene, Rome’s second river (once called “Teverone”), was the ancient waterway for transporting materials between the capital and the marble quarries along the river at the foot of Tivoli. The whole descent takes place within the territory of the Tenuta del Cavaliere, organic farm of the City of Rome close to Lunghezza. The initial briefing held by expert guides provides all the information required to carry out the activity safely: describes the behavior in the boat, the commands, the technique of paddling, the equipment and what to do in case of a fall in water. Further explanation is then provided directly on the boat. This path is actually a ring and takes place both on foot and by raft: you start walking from the house Tenuta del Cavaliere, along the dirt road that goes down on the left. After about 10 minutes of walking through the fields you arrive at the boarding point located under the road bridge. The river, which flows in the Roman countryside, is very quiet and offers striking and unexpected natural views. Once you landed, near some limestone caves, and walk down the dirt road and in about 10 minutes you come back to the farmhouse. The overall duration of the route is about 1.5 hours. This route presents no technical difficulty and is very suitable for children and families.